One day, Stan calls me up and says, “Wanna buy the machine? I gotta move out of the shop—they’re selling the property and they want the machine out. You can have it for $300.” It was an incredible opportunity, but I myself was renting a workshop on historic Huguenot Street in New Paltz, NY then, and had no place to put the machine. So I declined Stan’s offer. Time passed and I mulled things over. Up in New Paltz, my workshop neighbor was the farmer, Warren Jewett. Warren had given me rent-free use of a large old family cowshed, which I fixed up. That’s where I stored all the terrazzo chips I bought when Zanin closed, and later when Colonna & Co. folded as well. Warren was always so generous and helpful to me. I wanted that polisher. I knew Warren Jewett would let me store the machine on his property and would help me move it with one of his two powerful tractors. I ran the idea by him, and he agreed as I knew he would. So the problem was really on the Queens end of things. Next to Stan’s terrazzo shop was a sizeable construction yard, where all kinds of heavy equipment was parked. I asked Stan if he knew anyone there; and as it happened, he was great friends with the yard foreman. I went to speak with the foreman at the yard’s garage, and he was aware of Stan’s situation. I asked, “If I show up here with a flatbed truck, would you help me load Stan’s machine for $200?” With a dismissive wave of his hand, he said, “Sure, no problem.” He wanted to help Stanley out. I was thrilled. I had hooked up both ends. I arranged a date for the pickup. Before that, I went several times to Stan’s to scrub the polisher down with kerosene and wire brushes. That’s why I’m filthy in the accompanying black-and-white photo, which was taken in October, 1988. There were decades of grease on that machine. The day before our appointed Saturday moving date, I went over to see the construction yard foreman. It was Friday after 5pm. I went into the yard’s garage, and there he sat at a makeshift table, presiding over the largest poker game I have ever seen. There was a mountain of cash piled high on the table surrounded by all these construction workers. With my entry, they all froze like rats in a spotlight. I froze, too. The foreman said, “Oh, it’s you—we’re on for tomorrow morning, right?” “Yeah,” I said, and we all let you this huge collective sigh. Next day, I show up at Stan’s with a large flatbed truck I rented. The yard foreman drives over on a backhoe with a monster wrench. We try to unbolt the machine from its concrete foundation, but it was rusted solid from decades of wet grinding. He chained the machine to the backhoe, then went back for a cutting torch and torched off the four large nuts. 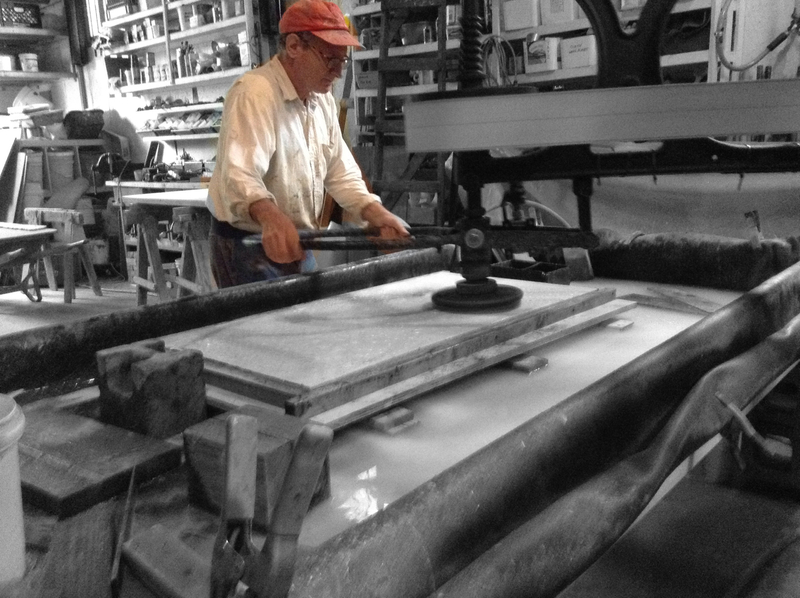 He lifted the polisher with the backhoe but it was unwieldy and quite heavy. He called for his son to come over with a forklift. The two of them did a lot of maneuvering to extract the machine. It was much more complicated than any of us had anticipated. They loaded the polisher. I strapped it down, paid them, and headed for the NY State Thruway. Turns out that the flatbed truck would not go above third gear. I drove 75 miles to New Paltz, doing 40 mph with the flashers on the whole way. Warren Jewett sat waiting for me on his tractor as I pulled onto Huguenot Street. I drove into the pasture next to the cowshed, and Warren offloaded the polisher onto some pallets adjacent to the cowshed. I covered the machine and returned the truck to New York City. I was ecstatic. I later built a vented shed over the polisher, and every Summer for twelve years, I would open the shed and brush clean motor oil over the machine. 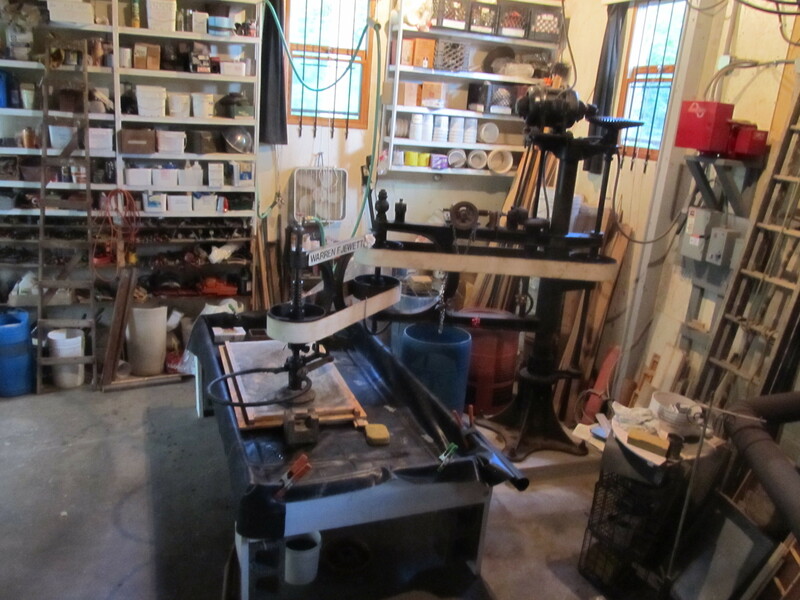 I eventually bought a sizeable workshop 18 miles from New Paltz in the beautiful foothills of the Catskills. I rented a walk-behind diamond saw and cut a 4ft x 4ft opening in the concrete floor. I excavated to bedrock and bored into that to attach the steel reinforcement cage for the concrete foundation/counterweight. The hard part of erecting the machine was to center and keep vertical the four 1-inch diameter threaded rods that would protrude from the concrete base. These had to correspond exactly to the holes in the stanchion’s base flange. Happily when a backhoe lowered the polisher onto its new concrete base, it was a perfect fit. When I tightened the large nuts to the bolts securing the base flange to the massive concrete base, I heard choirs of angels singing. I had the motor reconditioned, wired the on/off switch near the operator’s ring, and ordered new leather belting that was quite expensive. The silicon carbide grinding segments were no longer available, but I contacted National Grinding Wheel Co. They had the original molds and said that if I placed a large enough order, they’d fill it. I ordered a lifetime supply of segments, and so I’m good to go. I’ve added diamond technology as well, but there are times when I prefer silicon carbide. My polisher, made by the Patch Company of Rutland, VT is now 102 years old and still runs great. They sure knew how to make things back then. So there you have it—that’s how Lorenzo got his polisher. This story is dedicated to Stanley Mazeka and Warren Jewett, two fine gentlemen who currently reside in heaven. Thank you for helping me, and I hope to do you proud. Rest in peace.